back to you at your feet every time. He is housebroke via the previous owners using a kennel; and we have a doggy door so he is able to go out when he needs to. He walks around and inspects your vacuuming as he is not afraid of it. Barks only when he hears someone at the door. Will sleep with you on top of the covers. Appears to have been feed table scraps begs alot. 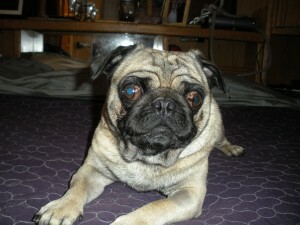 He is a very sweet dog and gets along with other my 3 other Pugs well.